At the highest level of a giant forest, thirteen kingdoms fit seamlessly together to form the great city of Canopy. Thirteen goddesses and gods rule this realm and are continuously reincarnated into human bodies. Canopy’s position in the sun, however, is not without its dark side. The nations opulence comes from the labor of slaves, and below its fruitful boughs are two other realms: Understorey and Floor, whose deprived citizens yearn for Canopy’s splendor. When Audblayin dies, Unar sees her opportunity for glory at the risk of descending into the unknown dangers of Understorey to look for a newborn god. In its depths, she discovers new forms of magic, lost family connections, and murmurs of a revolution that could cost Unar her chance or grant it by destroying the home she loves. Crossroads of Canopy is a debut novel which has some amazing worldbuilding and explores a number of social issues. Unar is a servant to one of Canopy’s thirteen deities, having come from poverty. Her escape from abuse and slavery had made her ambitious, helped by the fact she possesses a powerful potential for magic, and she firmly believes she’s destined to be the Bodyguard to the next incarnation of her deity. She’s not an entirely likeable character–she’s impulsive, occasionally selfish and lashes out at her loved ones. However, her strong desire for justice saves her from being unsympathetic. Despite being born to poverty, Unar grew up in Canopy–literally the highest stratum of the forest–and, as such, is privileged. Thus, it is unsurprising that she shows prejudice on occasion. However, unlike the other citizens of Canopy, she catches herself and constantly questions the injustice embedded in the status quo. Although I felt some sympathy for Unar, I found the story held me at arm’s length and didn’t engage me on an emotional level as much as I would have liked. This may have been intentional, as one reoccurring theme of the story is unrequited feelings across many relationships, both romantic and otherwise. However, there was plenty for me to engage with on an intellectual level, and it reminded me a little of Ann Leckie’s Ancillary Justice trilogy in that sense. There’s a common perception that fantasy doesn’t examine social issues in a way that science fiction does. Crossroads of Canopy dispels that notion by putting class and race at the heart of the story. The world is separated into three different societies located at different levels of the forest. Canopy is the highest level with access to abundant sunshine and fresh water. Understorey lies below, receiving very little sunshine and dealing with the refuse that is tossed on their heads from Canopy. We see very little of Floor, but the story indicates its citizens are plagued by floodwater and monsters. These three societies combine to form a literal class strata, where the higher you are the better off you are. This class structure is also intrinsically tied to race. Canopians are dark-skinned, while the sunlight-deprived Understoreans are pale. The story also deals with issues of ageism and ableism. This comes primarily through the Canopian society, where the citizens make offerings to one of their gods to protect their children from falling over the edge of the branches which form their home. However, the disabled and elderly too feeble to work are pushed to their doom. In this way, it highlights society’s cult of youth. Another thing I particularly liked about the worldbuilding is that it doesn’t use the typical broadleaf forests found in the US or the UK. Instead, we have the kind of rainforest often seen in Australia or Southeast Asia–the kind that features an abundance of gum trees and parrots. The story is a bit slow-paced with few action sequences. The writing style was also a bit difficult to get used to at first; there was a lot of terminology and names to wrap my head around, and I found the occasional use of alliteration distracting. 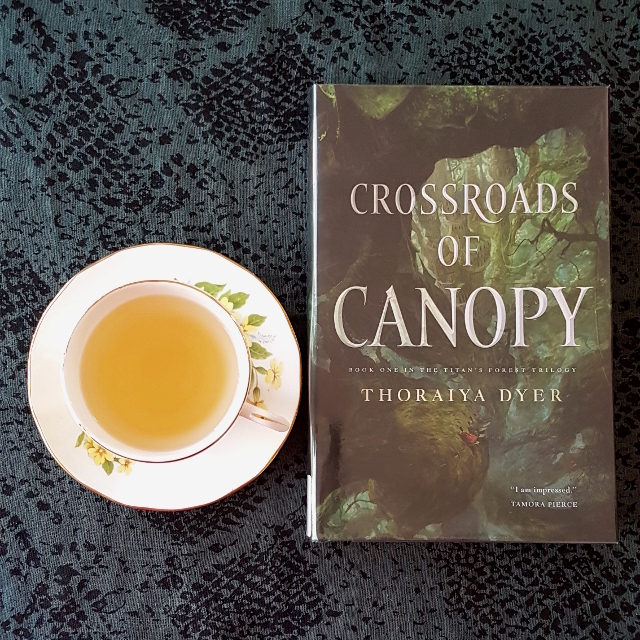 However, overall Crossroads of Canopy brings a fresh approach to fantasy, making it well worth reading. Hm, okay, this is all good to know. I just checked this book out from the library! And it is always beneficial to know what to expect, especially if what to expect is rather slow going. I’d be very interested to hear your thoughts on it, once you’re done.